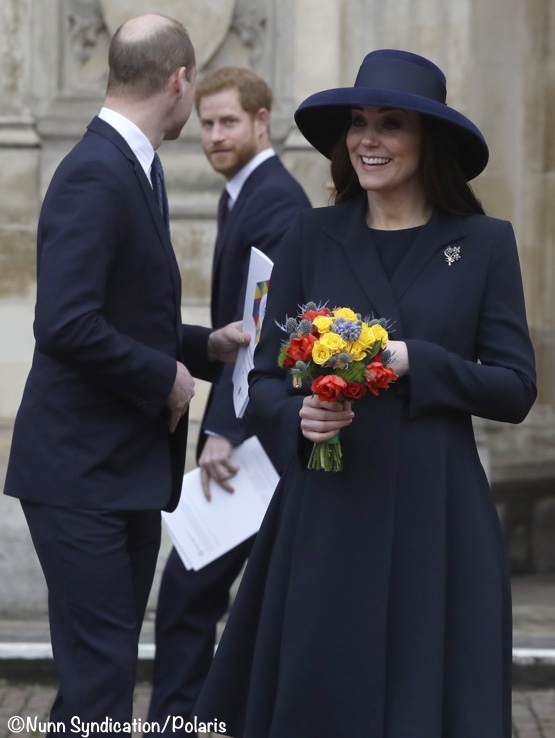 The Duchess brought back her Beulah London coat for the annual Commonwealth Service at Westminster Abbey today. 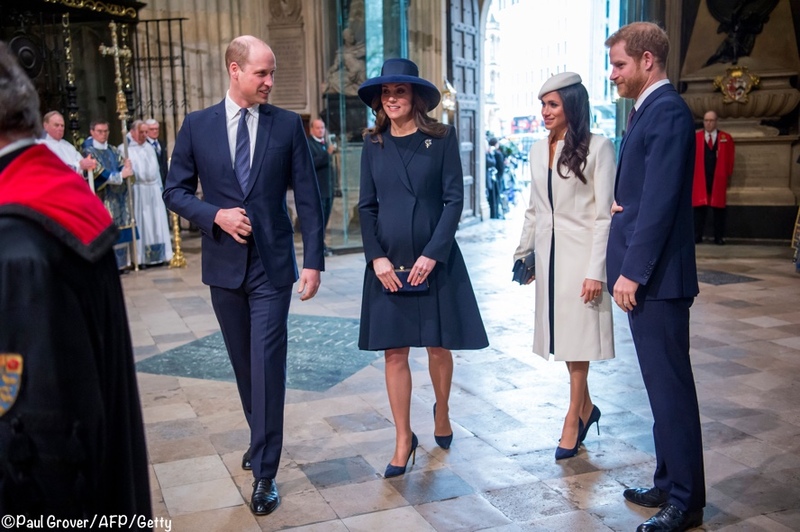 Kate, William, Meghan and Harry arrived at Westminster Abbey together. Another view of the Duke and Duchess. It was clear there was some royal fashion coordination; Princess Anne, Sophie, Countess of Wessex, Meghan, Kate and Camilla were all in navy or navy and cream. Fun fact: Princess Anne wore this same coat to the Royal Ascot in 1980 and also to the Epsom Derby in 1985. There’s some royal recycling for you. Thanks to Richard Palmer of The Express and Joe Little of Majesty magazine for sharing this background. Now to the other women wearing cream and navy, seen as Kate, William, Meghan Markle and Prince Harry as enter the Abbey. HM awaiting the procession to the front of the Abbey. 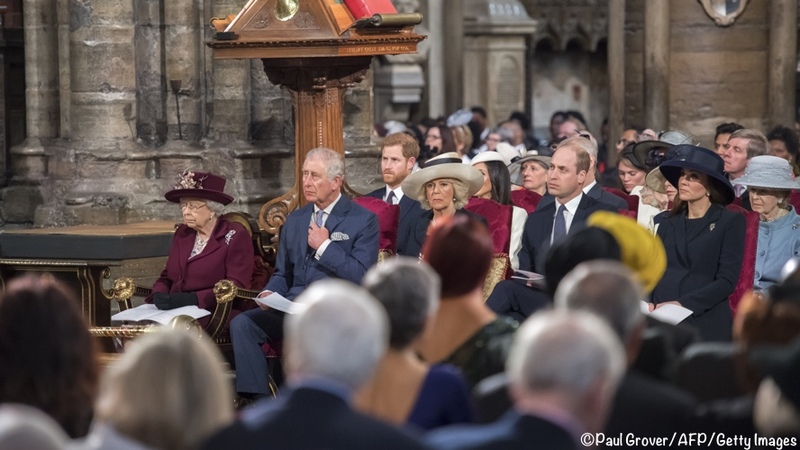 Other royals attending today’s service included the Duke of York, The Princess Royal, The Countess of Wessex, The Duchess of Gloucester and Princess Alexandra. Below you see HM, the Prince of Wales, the Duchess of Cornwall, Prince William and the Duchess of Cambridge. 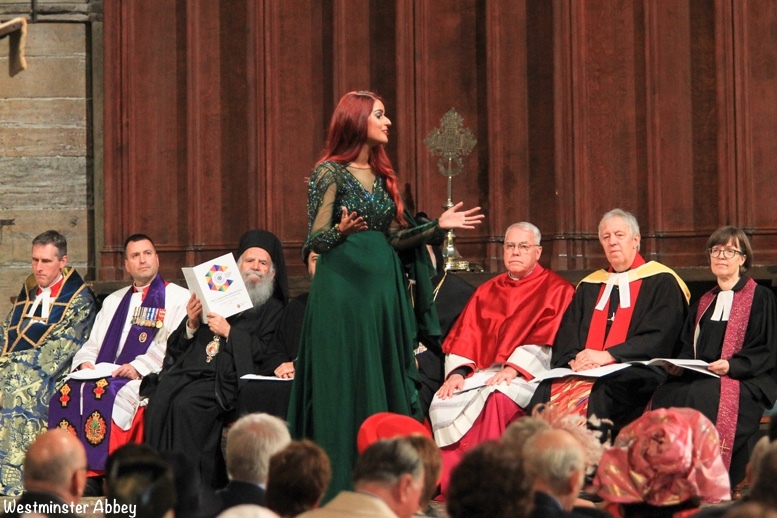 The theme for this year’s service is “Toward a Common Future.” Below, poet, writer and spoken word artist Jaspreet Kaur did a reading at the service. One Direction star Liam Payne performed John Mayer’s ‘Waiting on the World to Change’ during the service. As they departed the Abbey Royal Family members thanked many of those participating in today’s service. 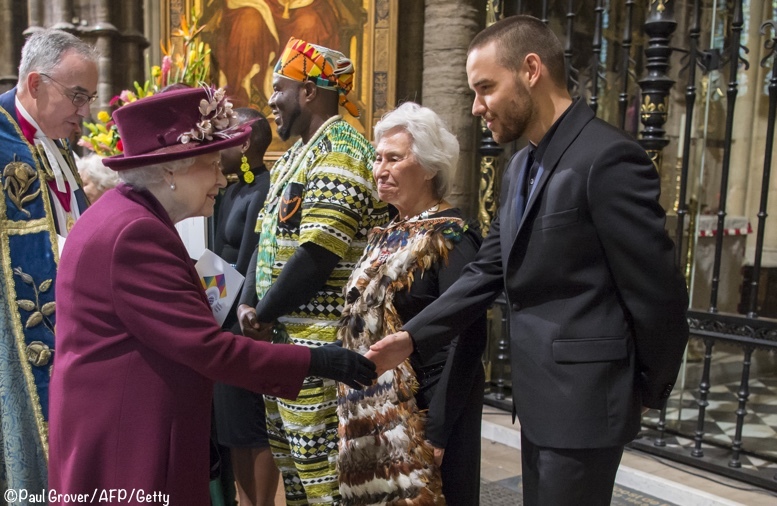 The Queen with Liam Payne. The Duchess being given a posey. 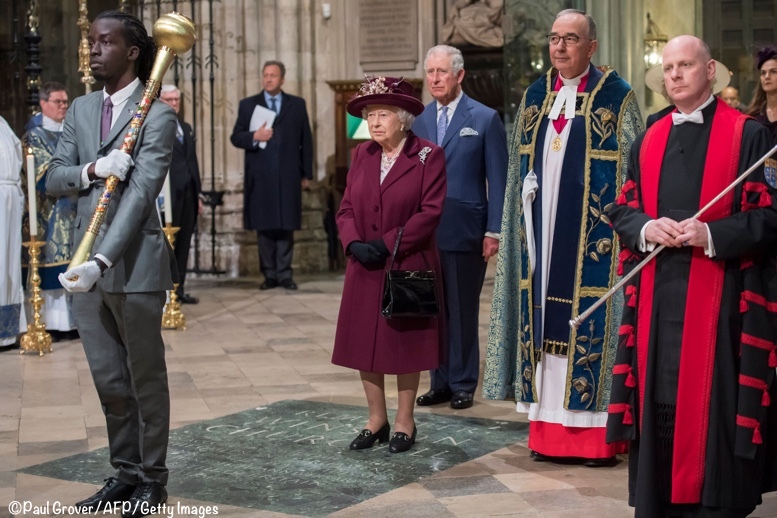 I love this photo of the Queen after the service. 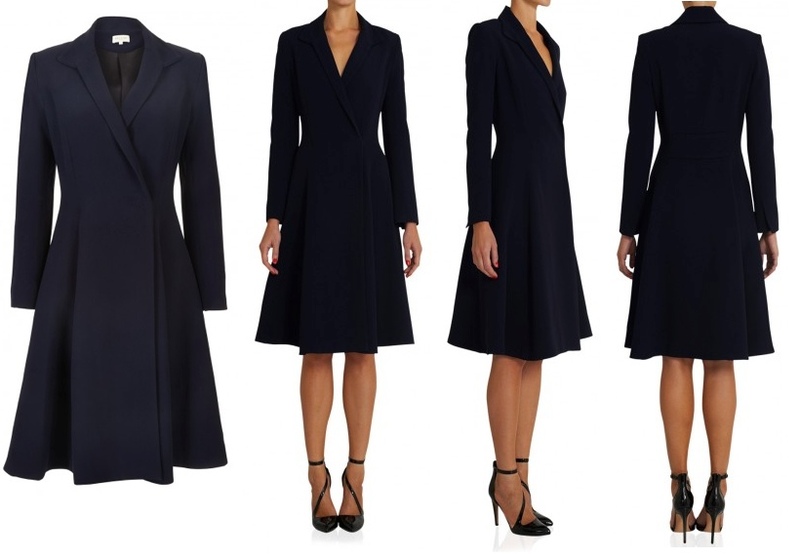 As noted above, Kate wore a Beulah London coat. The style is called the Chiara. Kate’s version of the coat is crafted in 100% wool; it showcases a trapeze cut, fitted at the bodice and then flaring out from the waist. Below we see Kate in the garment today, and three years ago at the memorial honoring those who served in Afganistan. With thanks to Sarah for the tip via her comment, Beulah is reissuing the Chiara; they are taking pre-orders here. Thank you also to Sara, she points out the version that can be ordered is made of an acetate/viscose blend. Kate carried the ‘Celeste’ bag by Jimmy Choo in another color, the brand’s navy suede. This is the third version of the Celeste we have seen her carry; below left, the ballet pink color and on the right, the vino colorway. The bag measures about 8″ x 4″ and can be used as a clutch or carried by the snake-chain shoulder strap. We saw the return of Kate’s ‘Malory’ pumps by Rupert Sanderson. The Duchess wore the much-loved ‘Breakfast at Tiffany’s’ hat that was first seen at the Afghanistan War Memorial dedication in 2017. Kate wore the unidentified earrings we first saw at the Royal Foundation Forum. Here is a closer look at the earrings and a brooch the Duchess wore with the earrings today. When the earrings were first seen at the Royal Foundation Forum many thought they were part of a Cartier set given to the Queen by her parents in 1945. After seeing better photos of the earrings today that is no longer the prevailing wisdom. I will be updating later with more photos; there are many I have licensed but haven’t had time to edit yet. We’ll leave you with this 1:30 video of the service from The Telegraph. And here is a link to the entire service. Many thanks to Trisha on the Facebook page for providing the link! Our collage showing what Kate wore. For all of the details on what Meghan wore, visit our sister site by clicking here. Was jewelry ever identified? I like this set on Kate. No, it’s not been identified yet, it remains a mystery. I thought everyone looked lovely. I do have one question just out of curiosity. Are Kate and Megan wearing the same shoes? I do love this pair every time I see them but it seemed odd to me that their footwear was so much alike. I love reading all the comments and the fact that everyone is so respectful. Lots of people commented on Catherine’s shoes. I admire her athleticism!! I couldn’t have worn those shoes when I was 21 and 110#. She’s not only tall, 36, and 8+ months pregnant, she’s attending a very public event where any little bobble would be loudly criticized in the main stream media. That takes courage!! I also thought Princess Anne looked fabulous! I never would have pegged her outfit as a recycle from the 1980’s. This look is a hit! This style of hat really suits her – I am not sure everyone could carry it of. On the topic of hats, wondering if Meghan will start exploring various hat styles. I thought the entire Firm looked quite polished. Especially Her Majesty. On a final note, I am amazed Kate is able to walk in those heels in the final weeks of pregnancy. I don’t like big hats (when I do like hats at all), it’ll be another 10yrs before the upper classes begin to stop wearing them to their events. I don’t really think there was a colour-cordination memo, navy is now ‘fashionable’, there’s more of it around, it’s cold so maybe a wintry colour was in order, they all keep navy for those sombre occasions when black is too much. Meghan wore cream, she has often, I read somewhere that she doesn’t wear ‘colours’, cream coats are her thing, if not white or black, a little navy & the occasional very muted dash of colour. Camilla often wears navy/dark blue too. I have been hoping that she would bring back this Beulah coat! I think it is such a beautiful and elegant fit. I prefer the hat worn in 2015 but this look overall was beautiful. And Princess Anne wearing a coat that is almost 30 years old but it still looks fresh and modern, that takes skill. Bravo! My first thought reading this was “Meghan in cream! Bride! Wedding!”. Very fitting. My second thought was “The Queen in red! National flag!” Anyway, the navy and cream is some serious family coordination. Funny! I also liked Annes coat and how she’s worn it since 1980. I think everybody looked really well today. So who designed Kate’s hat? It’s not mentioned in the post or am I blind? Admin, I was wondering about the color code here. While everyone else is in navy blue, why did Princess Ann wear ivory? and Meghan? That’s a good question, and one I don’t have an answer for. I’ve thought that everyone wearing solid navy blue would look odd, thus the decision to have one or two of the five women wearing the lighter shade, but I’m not at all sure how the logistics of that would have been handled. I assumed the dress code was for navy & ivory and all the ladies observed it in their own ways. Meghan’s sheath dress was navy. 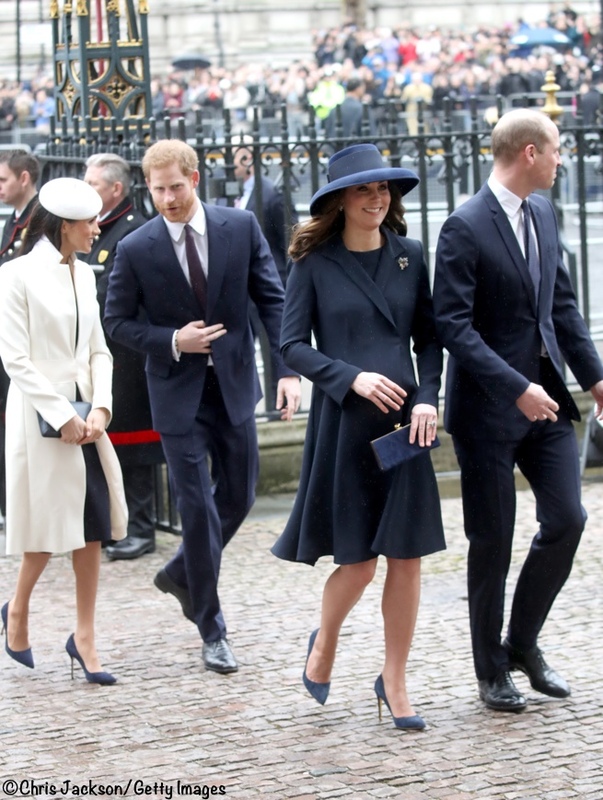 I do find it odd that all royal participants in this event showed up wearing various shades of navy and cream. But, I also find it very odd that a memo or other instruction would go out (from??) telling everyone what color to wear. I am just wondering if anyone with knowledge about such things can shed light on this. How likely would it be that all these women really were following instructions. Is there any concrete indication that this type of coordination of clothing really happens or is it just that we all find it hard to believe in coincidence. Or another question might be, what is the point of coordinating in specifically these colours, if they were indeed coordinated which seems very likely? Were cream, ivory and burgundy meant to be a riff on the Union Jack, as another poster suggested? I could imagine other people wanting to dress this way on Commonwealth Day, but it doesn’t seem to be the way of the Royal Family to play dress up. I completely agree with you Donna, I’m sure there isn’t a “dress code”, and that today’s colour coordination was more coincidence than planning. As for a red ,white and blue theme, the Union flag is just that and not claret, navy and cream! I must admit though, that I did really enjoy seeing the colours that were chosen, elegant as always. They probably just had the same thought. That it is a solemn church service but not mourning so they wanted dark but not black. Navy blue is then, to me, an obvious choice. Especially if they knew HM was going to wear burgundy so they would neither clash nor match 100%. And white/cream/ivory are all beautiful colours to match with navy to make the look less like mourning. I think a deep green or purple were the only other options and navy seems just a bit more appropriate for church than green or purple. I think Kate looks absolutely beautiful. I love the all navy look. I particularly love her hat. You must remember that for those of us who don’t live in the United Kingdom, the tilted hats and fascinatators are hard to get used to. I am not being critical, it is a British fashion. I love a traditional hat and especially wide brimmed ones. Queen Maxima comes to mind, but hers are even larger. I am not certain if hats are a British fashion, or if they are mostly a Royal tradition. When I’ve been in the United Kingdom, I haven’t seen that many women wearing hats. In 1917 the Roman Catholic Church, in the Code of Canon Law, decreed that all women must have their heads covered, while in church. Many other Christian religions followed this direction, to include the Church of England (Anglican) This Code was challenged in the 1970s and this rule was relaxed. In the 1983 Code of Canon Law—the one in effect today—the canon about head veils, was not re-issued. 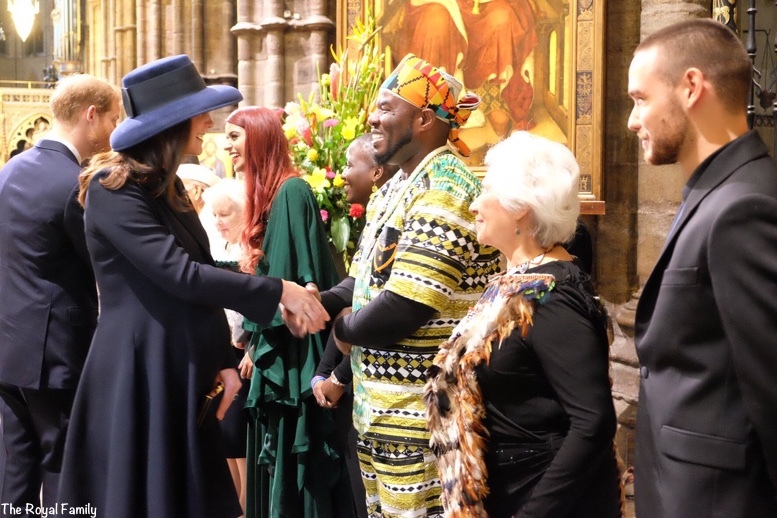 Still some women continued to wear hats in church and this certainly includes the ladies in the British Royal Family and several other Royal Families around the world. The Queen especially wears hats to compliment her outfits and I’d guess that she doesn’t feel fully dressed without a head covering. Hat wearing is traditional at Ascot and quite a few other events amongst the aristocracy. But other than garden parties and weddings, average British women are not walking around on a daily basis, with hats on their heads. I was born in the late 50’s and raised in the suburbs of NYC. Every little girl and woman I knew wore hats as part of their “Sunday best”. In fact, whenever I view the contemporary manner of dress of the modern day British monarchy, it recalls the clothes I wore in my younger days. All those solid color coats coordinated with the outfit underneath, as well as matching hats, bags and shoes! One always had separate winter and spring coats. I can still remember picking out hats with my mom. Yes, it was fun to dress for church. Now not many attend church regularly and those that go, no longer wear their “Sunday best.” We have become a casual society in North America. Britain is somewhat more formal, but few dress up like the Royal Family. It is great to see the decorum that most of the Royals display. Spring coats! Yes! I had those as a little girl in the 70s. On the Royal Foundation post I mentioned that the Daily Mirror said that the earrings Kate was wearing ( that she is wearing here ) were Oscar De La Renta. She looks stunning here, I was surprised she was in navy as normally it’s Megan who wears darker colours, but she looks gorgeous as always she always looks amazing whatever outfit she wears ! Although I didn’t like some of the Erdem pieces she wore in Sweden but that’s another story. She’s wearing blue a LOT these days … is this a hint??? I do think shes having a boy. She is much bigger than when she was having Charlotte but could just be because it’s her third child. Am the only one who isn’t convinced that she will be attending Harry’s wedding one month (or less) after giving birth? Kate looks incredibly beautiful and elegant today, I quite like her in a full hat and I feel like it balances this outfit well. Accessorising with a brooch is a nice touch, and it’s nice to see one worn by a young person. Anne and Sophie look stunning as always, and the Queen looks as elegant as ever. The jewelry is very reminiscent Pennino Bros. styles of the 1920’s. That’s a good call! I googled it, since I was unfamiliar, and they’re so similar in styling. I got to learn some things, too, along the way. Thanks! What lovely looks all around! I love the hat!! Princess Anne’s look was impeccable! And what can we say about the queen’s??? Outstanding!! From way over here in Canada, I think Kate looks wonderful! 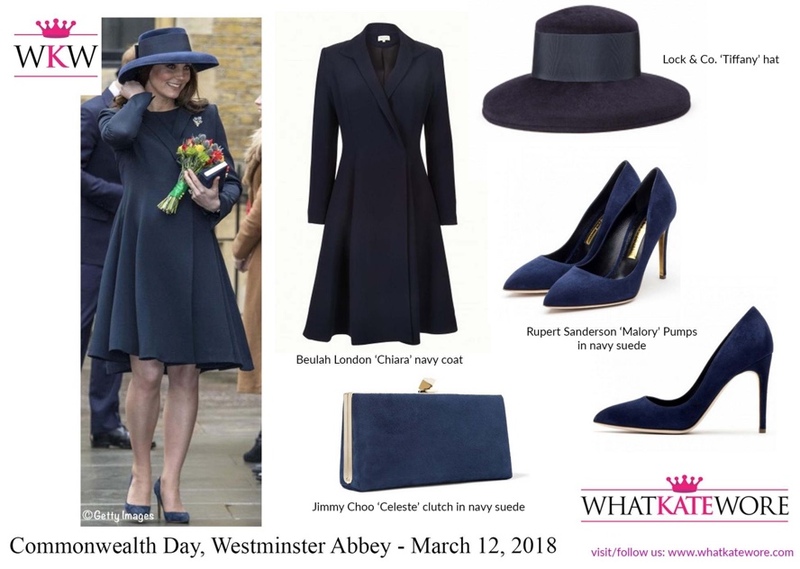 I love the coat, love her hat, and think the head-to-toe navy is lovely, appropriate for the occasion, and flattering! Absolutely stunning. I may be in the minority here, but I think this hat is so much better than the one she wore in 2015. Perhaps I don’t quite understand the hat culture, but I think it looks so odd to place a mini-sculpture on one’s head. The 2015 hat looked like a navy paper plate stuck on her head, ruining an otherwise beautiful look. At least this one is an actual hat, and a simple one at that. The embellishments on the other women’s hats just look silly to me. She looks so beautiful in navy. I loved the coordinating ensembles! I agree about those hats. I don’t understand the fascinators. To me they look strange so far forward practically hiding one eye. The DOC has such a beautiful face it’s a shame to cover part of it. The brim of this hat is a little low as it shadows her face but it is beautiful. Love the whole outfit today. Hope the Dutches gets to rest after St Patrick’s Day. I absolutely hate that hat – wretched. 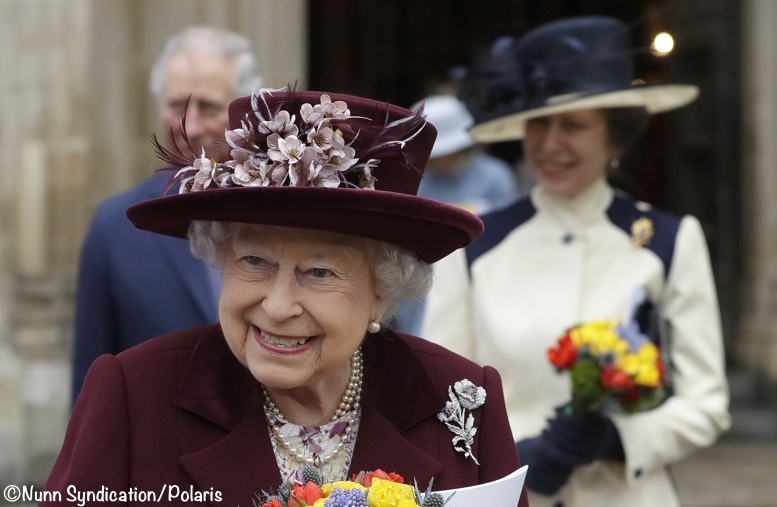 But can we just talk about the Queen’s hat? Utterly marvelous! HM, stealing the show again (as she well should). Ahhh, Match 2015, she looked amazing. She looks well put together her too, I’m just not into this hat or her hair down. She slammed it out of the park the last time she wore it. She looks so sophisticated and chic in 2015. I’m just not digging these broad brimmed hats or her hair down when she wears them. I love this look. 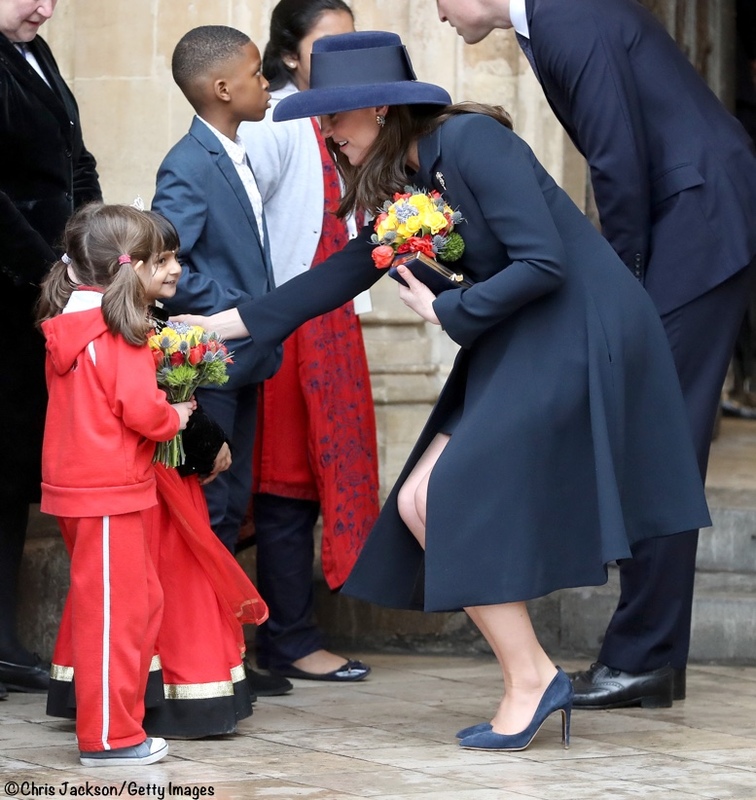 I adore navy blue on Kate, and I was a big an of the hat the last time she wore it as well. I like the shape of it and the way if frames her face, and as was pointed out, it balances her late-pregnancy figure. Absolutely stunning brooch and earrings, too. The Queen, as always, looked wonderful. I love this coat, but it’s quite obvious that it’s not maternity (the length of the coat in the front is shorter than the back because the bump pulls it up), and thus just doesn’t fit quiiiiite right. Having said that, I do think it’s a feat in and of itself that she’s wearing anything but stretchy pants and sneakers (like I did in the ninth month of both my pregnancies)! That she’s out looking absolutely gorgeous in full makeup, styled hair, and heels is an impressive accomplishment this late in the game. I love the monochrome outfit and, while not my favorite, I don’t hate the hat. The brooch is a fun, sparkly addition. The first time Kate wore this coat , my attention was taken by the tanzanite set and I didn’t notice how pretty it is. Especially the collar! Overall, this is a really nice look. It’s nice that she wore a brooch, and I actually like the vintage-y vibe. I don’t see people wearing brooches (in my area, at least), but I can’t think why, they seem like a fun way to add a bit of sparkle that’s different from the usual necklace/earring thing. I guess I’m in the minority, but I still don’t like that hat. I’m not sure if it’s the way it shades half her face, or the shape of the brim, but to me it really doesn’t flatter her face. She’s so pretty, nearly anything is flattering, but this hat doesn’t do her justice. I am just not a fan of the hat today and I am not sure why. Perhaps I simply favor the smaller styles for indoor occasions and the wider brims for outdoor events. I also think that her hair was a distraction from the look today. The blue coat was lovely and I enjoyed the coordination of color with the women. I think the hat is much more successful when her hair is up. The hair when down is a frame for her face, as is this picture hat, so right now they’re competing. This coat is so perfect for her stage of pregnancy. It’s fluid and elegant – not something easy to achieve when you are so far along. Just beautiful. The hat is ok but she looks better in smaller designs like the one she wore with that same coat back in 2015. Stunning. I don’t like that people compare or even talk about Meghan’s choices here as they have two completely different styles. And probably personalities as well! 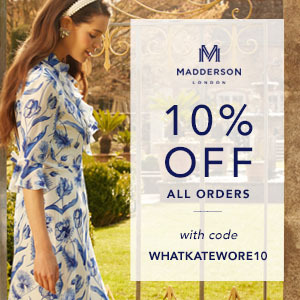 I know this is Catherine’s site, but, please can you post the link for the “What Meghan Wore” site. I know this is supposed to be about Kate, but I think HRM “stole the show” in her gorgeous purple ensemble. What designer is she wearing? She looks absolutely stunning! The Queens tailor is German born Karl-Ludwig Rehse. He is on service since 15 years for HRM. Has it really been three years since the Afghanistan Service? How time flies. This is a classic look for Kate, can’t go wrong wearing it. For me, HM and The Princess Royal were the standout ensembles. I don’t care how old TPR’s outfit is, it didn’t look dated and she looked stunning. As ever The Queen was fabulous, that colour, it was gorgeous. I’m not a fan of Meghan Markle’s style, but to me today she looked the best she’s looked since she first appeared as a future member of the Royal Family. I didn’t like the hat though. Overall, the ladies did an excellent job. I love navy blue, it’s my signature colour, so it was so nice to see so much of it. I do wonder though if William and Harry will ever desert their navy blue suits, and be a bit more adventurous like their father. I like the comment on Princess Ann. Amazing that she wore this coat for the first time in 1980! This is a fairly formal and conservative event so I don’t have any of my usual quibbles with the outfit being plain or anything, its very appropriate for this event and she looks very nice. I totally agree re your whole comment, I love the coat, dress etc, but the hat, it should work, but it doesn’t. I actually have a black hat in a similar style, so it is a bit odd, but I think it is something about how the end of the brim turns down. I think the coat is beautiful but, again, I really don’t think it works well as a maternity piece for someone in her stage of pregnancy. It IS designed as a maternity piece. It always was custom made. If this would be a normal cut only a bigger size with this bump you would recognize it at the front side hems. Them being shorter as at the back side. Thank you for your post. Kate looked very good. I thought also Sophie was looking very good. I like her coat and dress very much, but I think the low brim of the hat casts too much shadow on her face. Also, she’s head to toe in blue, and it would be nice to see a different colour for the accessories, like Sophie and Anne did. I love the coordination of blue outfits! Kate looks amazing! Fun to see Sophie too! Looking at the catalogue model (of course the angle and photoshop play a role) but I think the coat would look great too without what Kate wore underneath. It’s not like the neckline is too deep. And the hat has that ‘peaking out from underneath’ aspect to it which is really cute but may obstruct view of her face. And the Queen looks gorgeous in that colour. Beautiful! Or, if Kate wore the cream dress, that she had on the Scandinavian tour, it would fit with the navy and cream theme, and give the coat an entirely different look. Although personally I like the all navy look. And maybe a cream embellishment on the hat? Or would that be pushing it, I wonder. The Queen looks incredible. And I would definitely put my money on Kate having another boy in a few weeks time! Kate looks great and I can’t wait to learn more about the brooch and earrings. They look as if there may be red gems in them? I love the summary collage of the outfit! Can you make that a regular feature? And I know it’s not a competition. But if it we’re, Princess Anne wins today. What a stunning ensemble! Obviously, I’m here because I love Kate’s style, but I so enjoy these types of events where we get to see the whole family. It showcases how individual taste and style can still shine through all the “rules” of sartorial etiquette. BethE, I was thinking the same thing. I’ve never seen Princess Anne look so well put together in recent years as she did today. What a beautiful look on her. I think Anne and Sophie both looked wonderful. Really all the female royals looked great today. Agree! This was a stunning turnout for the group. Sometimes there’s one outfit that just seems “off” when they appear together, but not a wrong note here. Absolutely agree re: Princess Anne. I loved the Edwardian feel of the collar and shoulders. I’m amazed that the Beulah coat is made of 100% wool – it looks so light! Wool can be very light and is great for wearing in both hot and cold weather. I have a couple of thin, fine wool t shirts that are my go to in really hot days. 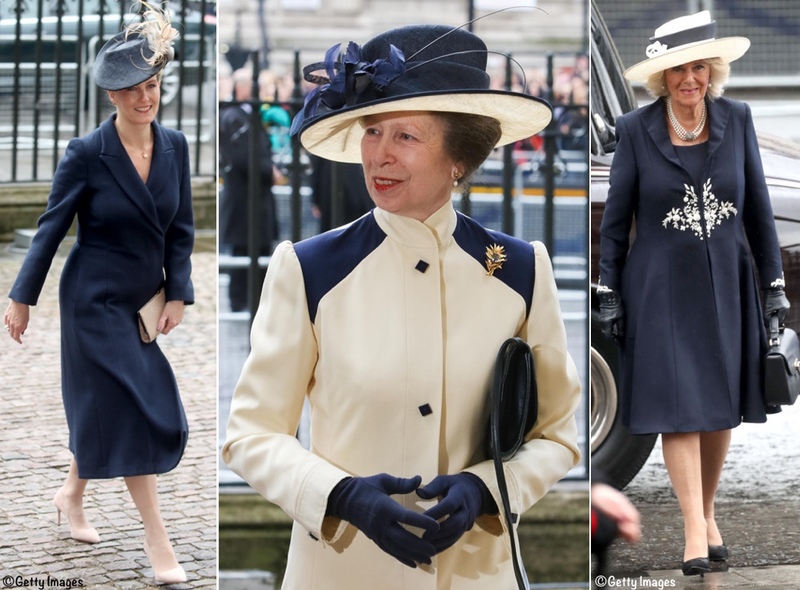 Princess Anne really had the winning look (although each woman looked so elegant and lovely). What timeless style! Did you see the story* about it being a 40-year-old coat? This is what they mean when they say “an investment piece”. I think we will be seeing many of Kate’s classic coats for decades. *Not sure if we are allowed to share a link, but it was reported in People, with photos of Anne wearing that same coat years ago. I don’t know that I would necessarily call the style “timeless”. I think its sophistication certainly is. But cream and navy were bulwarks of 80’s fashion, and we find ourselves amidst that aesthetic once again. Re-worn even 5 years ago, it would have risked being called unfashionable or outdated. But that makes TPR’s choice all the more cunning, the timing to bring back out an investment pieces so it seems fresh and new and fashionable once again. Kate looks great! She’s about a month ahead of me in get pregnancy and I don’t know how she’s wearing those heels! As soon as I saw the Queen in red I realized the royal ladies coordinated in Union Jack colors. Clever! I like your thought about the Union Jack colour theme, Diana, but I wouldn’t say the Queen is in red. I’d call it burgundy and other sites have called it plum or berry. The Queen has red outfits and if they were wanting to reflect the flag, then HM would have worn a true red. I wish William’s trousers were just a little bit longer. This is especially obvious in the first picture. Kate looks beautiful, as always! I did prefer the hat with her hair up as it was in 2017. Something about her loose hair today combined with the low brim of the hat seemed somewhat fussy. She’s so lovely it’s just a joy when we can clearly see her beautiful smile! Are Kate and Meghan wearing the same shoes? I think she looks very chic but could mix it up with a different style of shoe rather than her standard pump. I thought Kate looked absolutely stunning today – perfection. Also realize after Kate delivers we’ll be on a WKW ‘diet’ for awhile (sob), but also happy that she’ll get some well-deserved time out of the public eye! I have a wild hypothesis re the “color coordination memo” that everyone in the royal family seems to have received. I hope it is not off topic. My thinking is, Meghan often wears pants. She also often wears black. Rather than singling her out and telling her not to wear either, they sent around something to everyone that suggested certain outfits for men and women and certain color-scheme. Just a thought. I agree with Susan, it is totally coordinated. I am 100% sure that Meghan’s preference for trousers has never entered anyone’s head when planning this. She was never going to wear trousers to this church service, so that was irrelevant. Not only that, but Meghan (as did all the royal women, Kate included) had stockings on as required by protocol, which most women today wouldn’t be caught dead in . That tells me that someone has had a conversation with Meghan to guide her on the ins and outs when it comes to wardrobe selections especially at events in which Her Majesty and the other members of the royal family are present. I would suspect that she will follow Kate’s lead when it comes to pants, that is, at solo events or events with Harry (where appropriate) Meghan will wear pants and events with Her Majesty or other members of the royal family, you’ll see her in a dress. I don’t know where you live, but women all over Europe wear pantyhose all the time. The USA where Meghan is from originally. Yes, all those states that aren’t sub-tropical like California where Meghan is from. It’s easy not to wear stockings when you don’t need coats in the wardrobe. The east coast is under snow at the moment, the northern states are also cold, without mentioning alaska & higher altitude areas. I’d say most of the US ladies need a leg-covering in winter. I agree with SaraF, sofy and Lavender. I live in New York, it is freezing in the winter, and lots of women wear hose and tights. It is not at all uncommon. I agree that there was a conversation, maybe with staff, or some sort of communication regarding protocol. In New York, I see women going to church wearing pants or pant suits fairly often. At the same time, hats are not really worn. So some rules had to be communicated. And I think the beret is a nice nod to Meghan’s home culture were “fussy” hats are not something people wear. I think she picked similar style at Christmas, small hat, not really casual, but as close to what you can see on the streets of a big city as possible. Speaking of hats, of all the hats worn to the service, Kate’s is my favorite. And unrelieved navy somehow stands out against the uniform of navy and cream outfits. So glad to see this fabulous coat and dress again- like others, a real standout for me. I am also a huge fan of her hair in that side bun- delicious. I will be waiting with baited breath to find out where that brooch and earrings comes from- I can’t see the set per se on any of the royal jewels sites I frequent, but the style is certainly similar to those late 1940’s multi-stone flower basket/bunch brooches the Queen has in her jewel box. I’ve been hoping Kate will bust out some brooches, and I’m thrilled to see it today! She nailed it! Great fit, colour, silhouette, I even love the hat this time around! She looks comfortable in it, seems to move well. Love the foursome, they look so great as a family. How she is looking so fantastic while being so pregnant is beyond me. Yes, Kate! I think the duchess looked lovely. If I were nitpicking I’d ask for contrasting accessories (shoes clutch and hat) but overall this was a win. This hat will never be my favorite because I don’t like the shape and size. As I suspected when I first saw them, the earrings are definitely vintage. So is the broach. I have to believe they came from HM’s collection or from an older relative of Kates. I would have preferred the tanzanite earrings or Diana’s sapphire earrings. This coat shows just how valuable good tailoring can be. It’s very figure flattering even at this stage of pregnancy. I truly hope that the duchess can take a break from public life after St Patrick’s day. I adore this hat! It feels like vintage done in a modern way, which Kate sometimes absolutely nails. I’m dying to know more about the mystery jewelry and would so like to know how Kate decides when to break out which jewels? Does she walk into the jewel storage closet that holds all her wedding gifts and say “I think I’ll bring out these earrings this year, save the necklace for next decade.” What a mystery! I really disliked this hat the last time, but now I think it looks great. Perhaps it’s because her hair is down? Also, I loved the moment Kate stopped and turned around to wait for Meghan & Harry. Just love them!! People, she wore a brooch! Everyone always wants her to and there, she did it. She looks lovely and so did Meghan – cream for the bride. I thought the same thing about Meghan in the cream! Very much alludes to the coming wedding. Brooches look like they were meant for people of the Queen’s generation and age. SO old-fashioned and outdated…. I think it’s time for the brooch to be revived. Perhaps Kate and Meghan can bring it back into style. Wearing a brooch (or a jeweled ornament pinned to one’s clothing) is a classic way of accessorizing and has never been out of style. Certain pieces may look outdated to some, others would just consider them vintage. If it is a beautiful piece appropriate to the occasion it will not look old fashioned. Just think of that beautiful diamond maple leaf Kate wore TWICE during her last visit to Canada. Exquisite! “Matching sets of twee jewelry”? I’m trying to think of sets she wears that could be considered “twee” – the Mappin & Webb necklace and earrings? Not likely, I would love to have those in my jewel box, and would definitely wear them as a set. The tanzanite set? Ummm, they may not be a crowd favorite, but they’re definitely not twee. The Balenciaga pearl items? Nope. Now you have me pondering her set jewelry to find examples, ha! Of all the royal ladies, The Princess Royal has the most interesting look. What a great coat for her. Princess Anne has been wearing this coat since the 1980s, lol. Then it’s amazing that she can still wear it. Not many women can wear the same coat in their sixties as they did in their thirties. I agree SaraF, pretty impressive that Anne can easily fit into her clothes from 40 years ago! She is one fit woman who has taken very good care of herself. I love the navy/cream coordination among all the females. I don’t normally give a lot of attention to Camilla, but I thought her dress was very pretty. They all looked very pretty. I could not wait to get home and read your post. I always enjoy them. Thank you for this blog!! I didn’t like this hat last time around–it felt overwhelming. But looking back, I like it better with hair pulled back. The large clunkiness feels more statement-making with a chignon that with hair down. 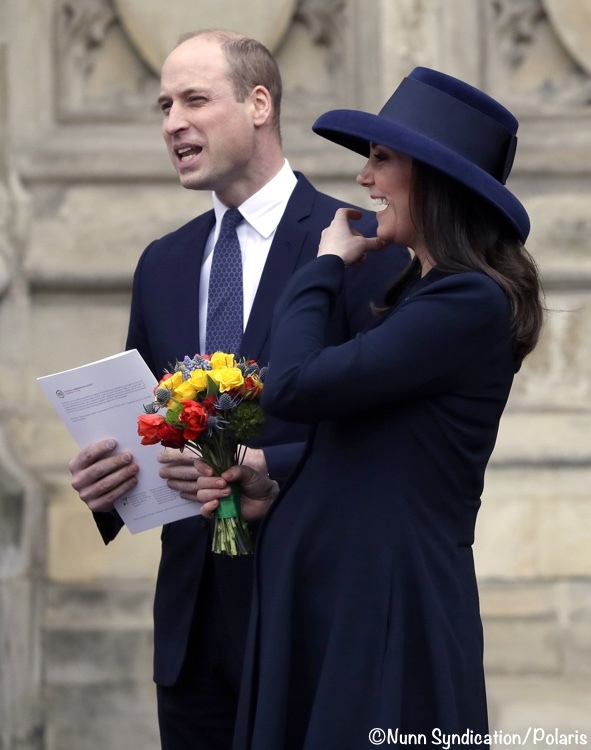 We often see Kate in daintier hats, but here I think the monochromatic and bulk of her hat balances nicely with her bump. I think for a big hat like that the look should either be sleek, tailored, streamlined or….pregnant! Anything in between and I agree with other posters it could very easily cross the fine line into matronly. The coat looks like it fits better in the shoulders this time around; the coat looks really well tailored overall. I wonder if some of that has to do with perhaps waiting until the last second to sew the clasp just so? I wonder if what was under this had ruffles though, it seems like the top isn’t lying flat or perhaps the lining is puckering a bit? I wonder if it was on purpose that the more senior royals got to mix navy and cream and have patterns and decorations and the more junior women stuck to monochrome. All the royal ladies, Camilla, Kate, Anne, Sophie, Alexandra and Birgitte are wearing repeated coats and hats, so I’m thinking it was just a matter of finding things that fit and are appropriate for the occasion and weather. Oh, her poor feet! They look so uncomfortable! I hope she went home to a hot foot bath and comfy slippers. I loved this coat the first time round but Kate’s pregnancy has now advanced to the point where the fabric appears to be pulling at various points which looks unflattering. I’m also a big fan of the wonderful Tiffany hat, but am finding the shading of such a deep brim too heavy over the already dull shade of this coat. The jewellery is very pretty but is too delicate to hold its own against so much uniform navy. I love the new clutch. It’s not a bad look, just one that doesn’t quite gel and I can see it’s an obvious pick given the unofficial dress code adopted by some royal ladies. However where the outfit really scores points for me is in creating a more muted look for the Duchess, the better to act as foil for her soon-to-be sister-in-law. Good call, Kate. I believe, for the first time ever, I find myself disagreeing with you! Shocking! I thought the earrings and brooch brought a nice sparkle, and I’m sure, in person, an interesting diversion for the eye from the unrelieved blue of the rest of the outfit. I thought it a keen decision in accessories. I’m honoured to have such a lovely poster to disagree with me, it’s what WKW is all about. Delighted to hear the jewellery has a fan, I quite like them myself but not with this outfit. I often wonder about what governs my fashion sense, believe me. So often I come out against something and a little while later take another look and suddenly everything is fine. Yes, I had the same thought. Last wearing, the front flap was pulling at the hook/clasp. Fits better this time, so perhaps a tiny adjustment was made. It’s so interesting how two people can look at the same dress and see it completely differently. I thought last week’s Seraphine dress was tight and unflattering and you thought it was just right and slimming. I think yesterday’s dress was well-fitting and elegant and you find it tight and unflattering, lol. I have never been pregnant, but I would imagine at this point in Kate’s pregnancy how the baby is positioned and how much swelling she has which I imagine changes slightly day to day, might be impacting how her clothes are fitting. So what might have looked great yesterday, might be awkward today and go back to great tomorrow. I can’t think of any reason Kate should wear a more subdued outfit when Meghan is around, except for at a Meghan-centric event such as her wedding of course. I’d wager that Meghan will receive plenty of attention whenever she’s out, no matter what Kate is wearing. But if indeed that was part of her thought process in choosing an outfit, kudos to her for such unnecessary thoughtfulness! I semi-agree with your comments on the fit. While I don’t think it looks too tight, I find that for some reason, the dress looks bumpy on Kate in different areas, particularly near the darts on the bodice, like the dress she’s wearing underneath is too structured. However, I find it hard to believe that at this stage in her pregnancy she’d be wearing anything but a slip-style dress under such a coat dress. It’s more evident in certain photos. The Beulah website says the coat is made of acetate and viscose, so perhaps the coat material is just not heavy enough to hide the texture of a less-smooth dress below it. I like the hat, but I think it was more flattering with her hair up. With such a wide brim, it casts a large shadow, and we lose the elegance of the top of her coat and neckline. An excellent theory about what may be causing the coat to fit differently this time! I agree that the coat doesn’t seem to me to be “pulling” so much as just not hanging smoothly. I’m going to accept this theory to explain it. I agree with Crystal, there is no reason why Kate needs to be a foil to anyone. I find the ongoing need to connect or contrast Kate’s fashion choices with others, either by direct or indirect comments, entirely annoying. I’m a fan of the comments that reflect on Kate as a person and her fashion choices. On the whole, I agree with you about comparisons, but for an event like this where we have several royal ladies in attendance, it is hard not to compare. And here we have the additional mystery of the blue coordination. Heck, we are even comparing 2018 Princess Anne to 1980 Princess Anne. It is inevitable. Hopefully this isn’t repetitive, but if it is, I apologize. It is the comment I posted when another reader raised the issue of comparisons; it is a topic I am sensitive to, and one we’ll probably revisit periodically. Kate looks wonderful. I love the hat, the coat, the jewels – everything!! Yay for the hat! It’s one of my favorites. This is a great look on Kate and all the repeat pieces are worth repeating. I like the monochromatic look. It is effective that Kate is wearing a brooch on her coat, although I’m not sure that I especially like this brooch and earring combo. They are a bit fussy looking. Other than Remembrance Day, when the Royal Family wear all black, I can’t think of any other occasion when all the ladies have been dressed in the same colour. It is rather fascinating and certainly adds harmony and unity. Anne, Sophie, Camilla, Meghan and Kate all look great in their variations of navy and cream. Navy shoes are often a staple in the wardrobe of British women. I’ve purchased navy shoes in England, as they are not always easy to find in Canada. The Queen stands out in a different colour and she look lovely. This was a very meaningful and beautiful event. Nobody does pageantry like the Brits. Thanks for your comment on our pageantry, we’ve had a few hundred years to perfect it. As to colour co ordination, this is a subject I have found fascinating i.e. Does HM decide her colour then everyone else compliment it? This occasion MUST have had a theme to it for all royals to have chosen navy and cream in which case how far in advance do they plan their outfits? I am sure they all got a memo about the color scheme. This is no coincidence. Your post says it’s wool, but the link to preorder says otherwise…? She looks so beautiful and I love the jewelry! Is it possible that the brooch and earrings are from the Middleton side of the family? That is one of my thoughts as well. They’re definitely vintage but not particularly blingy—not covered in diamonds—so they could well be something from a grandmother or great aunt. They could also be simply purchased from a jeweler who deals in vintage pieces. This time, I do like it a lot. Especially the hat. Well done! She looks great in this. Very put together. Classic and classy. Wonder how much longer she will work. The Duchess looks positively regal in that wide brim hat – What a glamorous way to balance her growing baby bump. To look this beautiful this far along in pregnancy…I am in awe. Curious about the jewelry – looks vintage and quite pretty. I love the royal color coordination. They’re a riff on the colors of the Union Jack. You can never go wrong with navy for a state occasion, either. Loved this ensemble the first time—glad to see it again with an even better hat. With all the color coordination among the immediate royal family, I wonder if there was a professional family portrait taken earlier in the day. I was going to say the same, I certainly hope they all took a photo together! That was my immediate thought, too! Great job with this post! Keep it up!! I have to admit I was not enthusiastic about the 2 most recent ensembles worn by Duchess Kate. But this, I love. Classic. Timeless. Perfect for the occasion. She looks absolutely beautiful. Well done. I can’t agree more. Classic. Timeless. Perfect for the occasion. AND, as opposed to the outfit Kate wore on March 7, a great fit. Yes! This Beulah coat is one of my all time favorite looks and I was hoping it would make an appearance this pregnancy. Interesting to see the earrings paired with the matching brooch. I love the dress, I have since we first saw it. That hat though. I cannot with that hat. It’s just so matronly! I can more easily imagine it on Camilla, or HM, rather than Kate. I think the hat looks fantastic. Agree – love the dress, not a fan of the hat shape. I thought I was the only one who isn’t a fan of that hat. If there’s any occasion to give an 8 months pregnant mother of 2 a pass to where what she wants without the “M” word – its a formal occasion with her grandmother-in-law Her Majesty. Maybe its just because I’m only a few years younger than Kate, but the many comments when she dresses more conservatively or “matronly” are getting to be a bit much. She’s no longer the very young woman we all met as a royal GF or fiance and its not surprising that she’s continuing to add pieces to her wardrobe that will serve her for decades to come. I’m in total agreement with you. Do we really expect her to continue to dress and wear her hair as she did in her early 20’s? Both she and Meghan are closer to (gasp!) 40 than 30 and it would start to look ridiculous if they persisted in hanging on to the stylings of their 20’s instead of naturally maturing into the responsible women of the Royal Family that they are. I’m the exact same age as Kate (well 3 weeks younger) and I have no problem with the “m” word to describe some of her outfits. I don’t think it applies here, but sometimes – yes. Conservative =/= matronly. Yes! This Beulah coat is one of my all time favorites and I was hoping it would make an appearance this pregnancy. Interesting to see the earrings paired with the matching brooch. The beulah London coat is available to pre order on it’s website. Love this coat one of my al time favourites ever. This is a beautiful and elegant ensemble for Kate–especially so at this stage of her pregnancy. It flows and skims over her, is soft and flattering, and looks very comfortable to wear too.I always liked the hat , so that’s a great addition. A poster ont he FB commented that Kate’s hair should have been up. I disagree–it would create far too much bulk at the neck under such a low brimmed hat and be very uncomfrtable to wear. Her hair being down was perfect. I would love to know more about those earrings and the brooch–they look like they could be from the 1930s or through the 1950s–comparing to some jewelry my grandmother and my mother had. I still think they might be pieces that come from Kate’s side of the family. Or perhaps they are new retro looking pieces. As one who has longed for Kate to wear brooches or pins, I’m happy to see this!! Love the color coordination today!! Everyone looks really smart and well turned out. Interesting that the Queen chose a very different color–she does stand out and that’s probably the point!! I have to say that my favorite look of the royal ladies present today, might just be Princess Anne!! The cream with the navy accents looks very striking and her hat is fun and a statement piece too! I agree that Anne looks stunning. This is the best outfit we’ve seen on her in a long time. Someone on another site said that Anne first acquired the coat in the 80s. Not sure if that is true, but if it is, I can see why she kept it. Clearly the memo went out that navy and white/off white were the order of the day! I like the coat. The shoes are fine. I found it interesting that Meghan and Kate wore similar styles. I don’t like the hat (sounds like I’m in the minority, since the post refers to it as “much loved”). The color is a bit off compared to the coat, I think it looks better with the patterned coat she wore it with in 2017; and it’s just so BIG! The jewelry gives me ‘woman of a certain age’ vibes. She looks amazingly healthy and happy though! I didn’t care for the hat in its last appearance but I think that here the bigness of the hat balances Kate’s current figure and draws the eye away from what people like to call her expanding waistline. Kate looks elegant and lovely today. The coat of this coat is wonderful for the fuller maternity figure and I like the navy very much. I loved this look in 2015 and it still looks great today. I think this hat is one of my favourites on Kate. Accessories were spot on and it was great to see Kate wearing a brooch. All in all a wonderful look. I meant “cut of this coat”!! There! See? You can look elegant, graceful and gorgeous even in your ninth month. Kate looked absolutely lovely today, a perfect 10 in my books. I liked Princess Anne’s coat and hat very much too.